The kitchen is quite nicely preserved by the care-takers of the SKS farms. 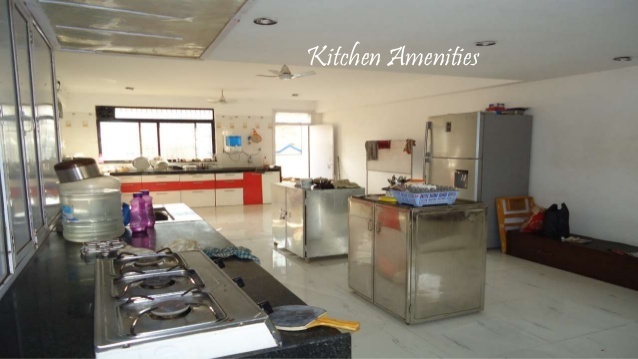 It contains all the required kitchen appliances, such as microwave oven, refrigerator, chimney, neat and tidy modular kitchen, well-maintained utensils, etc. You can enjoy some delicious food available at this farmhouse, which is exclusively cooked by the care-takers. However, the visitors or the customers who are taking this farmhouse on rent are not allowed in the kitchen for certain reasons. Nevertheless, the main focus is to serve you better with quality and hygienic food.